How Tim Winton got my mojo back, and other stories. They all hurled sticks for galumphine mutts, their sun-fucked faces shining with adoration. The 2017 state election campaign was one of the most gruelling periods of my working life. It wasn’t all because of the self-imposed workload; equally to blame was the nature of the work. Without really intending to, I had become what felt like the sole statewide reporter questioning the Roe 8 project, simply because for every story I wrote, more swarmed from the woodwork with questions demanding answers. The more I looked in vain for those answers, the dodgier the whole project looked. I wrote countless reports on the protests, the machine lock-ons, the clashes with police. I wrote The Idiot’s Guide to Roe 8, and covered the Senate inquiry into the unnecessary slaughter of animals caused by the haste with which the works were being rushed through pre-election. After the release of more than 350 pages of documents when Alannah MacTiernan’s Freedom of Information application was finally approved after the government spent years fighting it, I hunkered down with the documents and finally produced one of the most demanding stories of my working life, Figures fudged in Roe 8 rush job. Roe 8 was by no means the only environmental issue I covered in the months preceding the election. I covered the Beach not Bitumen campaign against the Esplanade extension through Bush Forever land in Scarborough and Trigg and the No Houses in Wetlands campaign against the bulldozing of Carter’s Lot in Bayswater – including another trawl through Freedom of Information documents showing the approvals for the development had been based on incomplete paperwork. I covered the establishment of marine parks scientists were calling “paper parks” because of the lack of inclusion of any sanctuary zones for marine life. I covered the race to the bottom that was the evolution of WA’s hunt-to-kill ‘serious threat’ shark policy. I covered the new Biodiversity ‘Conservation’ Act passing into law, complete with a clause allowing an environment minister to approve the extinction of any species should ‘progress’ require it. Hot on the heels of this charming piece of legislation came the approval of the Yeelirrie uranium mine, ignoring the Environmental Protection Authority’s knockback on grounds the mine would cause the extinction of subterranean fauna species. Things that look like prawns, and aren’t cute, but whose role in purifying our underground aquifers could be significant – things that should be studied further, not destroyed by humans drunk on their own power. As the election drew near I was going to write an opinion piece drawing all this together, but by then I was just too damn exhausted. (Note, it’s now May that I’m writing this). The only thing that kept me going was the emails that poured in from readers after every story, saying thank you, and pointing me to the next. Still, it was disheartening. I was starting to think it was just too hard to keep caring. Those emails from LinkedIn offering cushy jobs in PR, toeing the company line, were starting to look very attractive. Especially since more emails were coming in from people asking me to investigate more stories, more stories I would never, even if there were twelve of me, have enough time to get to. In fact, I just looked at my Evernote and found this. A blurt, jotted then forgotten on February 21. I am utterly competent, hard, brisk but compassionate and capable. At these emails that just keep coming. It was in this frame of mind I picked up Eyrie. I was innocent of its subject matter, having seen it in a bookshop and remembered that I had been planning to read it since its 2014 release. I thought, now is the moment – I was headed to Rotto for the weekend for a wedding and planned serious down time. Eyrie starts with a jangling hangover and a weird wet patch on the carpet for Tom Keely, divorced by his wife and disgraced in the public eye after an event in his previous professional life as an environmental campaign spokesman left him unemployed. The mining companies would love to have him come to the dark side in their PR departments, but he’s not yet having a bar of it. Instead, he staggers from blind drunk to blinding daylight, trying to work out how to pay the bills now his old career has locked him out for good. 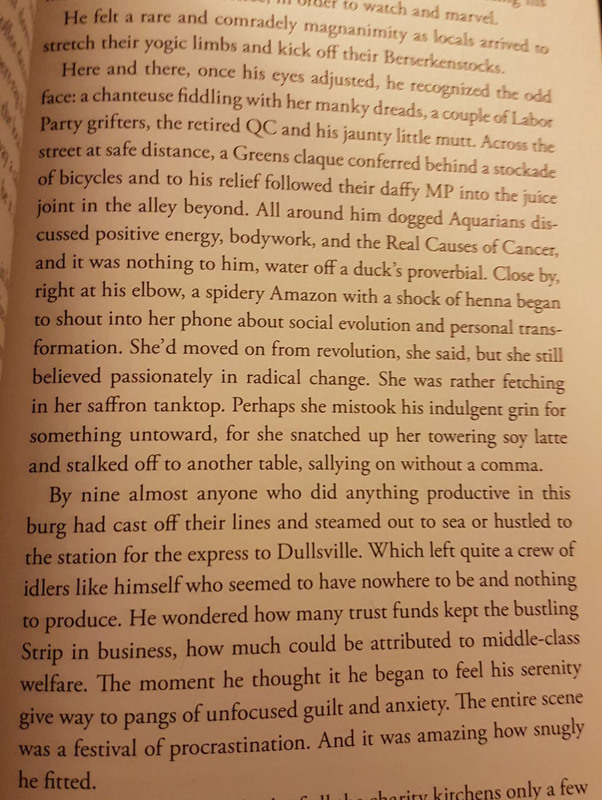 He is “doubly bound, trapped like a bug in a jar – addled, livid, dizzy, butting his head and turning circles”, high up in his ‘eyrie’ – atop a bleak block of flats in Fremantle inhabited by people down on their luck. The block, in real life, is one nicknamed the ‘suicide flats’, generally regarded as a colossal town planning mistake in Freo. Into this block of flats, and the mess that is Keely’s life, returns a distant childhood friend, bringing a hefty set of her own problems and a vague but highly uncomfortable sense of responsibility for Keely. 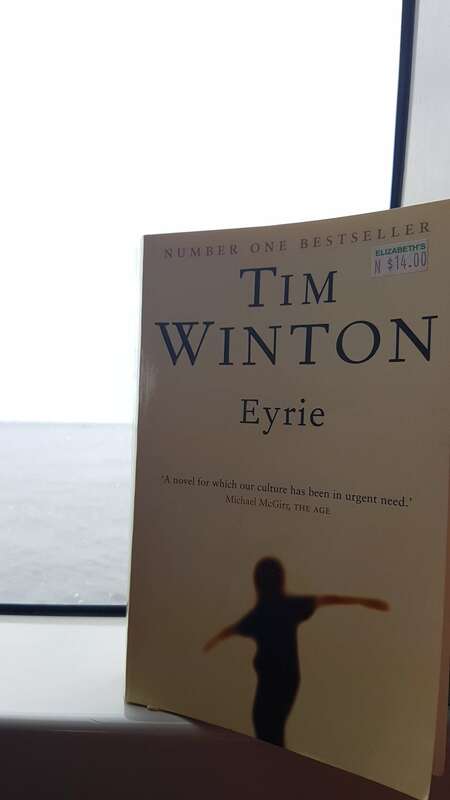 Whenever I mention Tim Winton, one of my most beloved authors, inevitably someone tells me they still have a Cloudstreet hangover after being made to study it in school. I never understood this, but I never had to read it for school. I just read it because that’s the kind of nerd kid I was. Whether or not they have a point, I say to them – get over it! You are missing out. This book is raw, angry and humbling in its brilliance. It casts a merciless glare on to the murky underbelly of environmental politics and activism in WA, and their uneasy coexistence with the all-powerful mining industry. It brings Fremantle and Perth into sharp relief, cities painfully under-represented in our national literature. Ours is a culture dangerously lacking in self-reflection and as Winton shines his pitiless light on Keely, he shines it on us all. It’s hard to look at but harder to look away, like squeezing a zit under a fluorescent bulb. He doesn’t have to be pretty. It’s stripped down to diamond hardness. The emails have piled up over my long weekend. But this time, a different email lies buried among them. Would I like to interview Tim Winton pre-election on gas fracking? You’ve got to be kidding me. I am spent. There is a week to go until I can drop this gargantuan election effort. I am behind. I still have more stories to write than I can poke a stick at. I have researched every bloody environmental issue under the sun in the lead up to this election. Except bloody gas fracking. I have only the vaguest idea of what it even is. I thought, bless me, there was one thing I was going to let slide. Of course, I make time. I do some hasty cramming. He’s my hero. People say you shouldn’t meet your heroes, because they will disappoint you. But this is not always true. Winton talks like he writes. He is funny and self-deprecating and wise and full of memorable idioms. He tells me it’s normal to get discouraged when you campaign on environmental issues. He riffs on power and politics and defeat in WA with the authority of someone who knows all the dirtiest secrets. I’m entranced. He talks for 40 minutes. I try not to interrupt in case he remembers his time is valuable. I summon energy, pull together research and write another pre-election environmental story. The result got more than 10,000 readers – testament to Winton’s star power. There has now been a change in government. Polling said Roe 8 was a factor in the decisions of about 20 per cent of voters – a significant influencer. The new government has helped buy back Carter’s Wetland, stopped the Esplanade extension through the dunes, and has said that while the Yeelirrie mine approval still stands, it will not approve further uranium mines. Its true stance on gas fracking remains to be seen. My trust in governments, like everyone else’s, runs sadly low. But the election coverage was, nonetheless, worth the effort.